Growing populations put pressure on local utility services, so expansion of those services is the inevitable result. When expansion of wastewater treatment infrastructure is needed, it comes with the added concern of managing an increase in nuisance odors and emissions. That was the challenge faced by the Mount Holly Municipal Utilities Authority (MHMUA), which serves residents of suburban southwestern New Jersey near Philadelphia. Commuters and nearby residents were already complaining of nuisance odors from the Authorityʼs main plant. In addition, a second treatment facility was built to meet the regionʼs growing needs. A more robust odor control regimen was needed. After a thorough exploration of available treatment systems, a “green” municipal odor control solution offered by BioAir Solutions was chosen. MHMUA’s original wastewater treatment plant was aging. Even as the region’s population increased, the plant was no longer meeting its design capacity of 5 million gallons a day (MGD). It was also the source of foul odors which caused complaints from nearby residents, businesses and commuters who drove near the site along Rancocas Road and the Mt. Holly Bypass. Part of the solution to MHMUA’s problem was an expansion of the Rancocas Road site as well as the construction of a second treatment facility —the Maple Avenue WWTP— designed to accommodate another 3 MGD. The Authority determined that both treatment facilities needed modern odor control systems, which required air discharge permits from the New Jersey Department of Environmental Protection. This is an example of how odor control goes beyond just elimination of bad smells. Often, compliance with local, state and national environmental standards is also a factor. 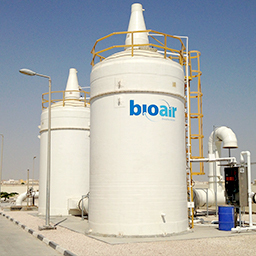 BioAir experts determined that successful odor control could be accomplished using state-of-the-art biotrickling filters. Instead of relying on dangerous chemicals or costly carbon filters, our EcoFilter biotrickling filters support biological processes that break down odorous compounds and release clean air. Our article on biological H2S removal explains the concept in greater detail. We installed five EcoFilter units in total, two at the Rancocas Road site and three at the Maple Avenue site. One EcoFilter was installed in the headworks area to treat hydrogen sulfide (H2S), ammonia (NH3) and other organic odors coming from a gravity sludge thickener, rotary drum thickener and the headworks bar screens. The system was designed to treat an airflow of 4,800 cubic feet per minute (8,155 cubic meters per hour). The second EcoFilter was installed to treat H2S, NH3 and other organic odors coming from a sludge storage tank and from the #2 surge tank. It was designed to treat an airflow of 4,000 cubic feet per minute (6,796 cubic meters per hour). Two EcoFilter units designed to treat 1,030 cubic feet per minute (1,750 cubic meters per hour) were installed at the headworks to treat H2S and other organic odors. A third EcoFilter was installed at the drain pump station to treat H2S and other organic odors at a rate of 515 cubic feet per minute (875 cubic meters per hour). System inlet H2S concentrations measured 5.35 ppmv on average. This statistical success is confirmed by reports from those who work, live and commute near the sites. Nearby residents and business owners no longer complain of foul smells. Busy commuters are no longer annoyed by odors as they drive past. Workers at the plants are more comfortable —and more productive— on the job. The sustained population growth in the region can continue without the barrier of bad smells. 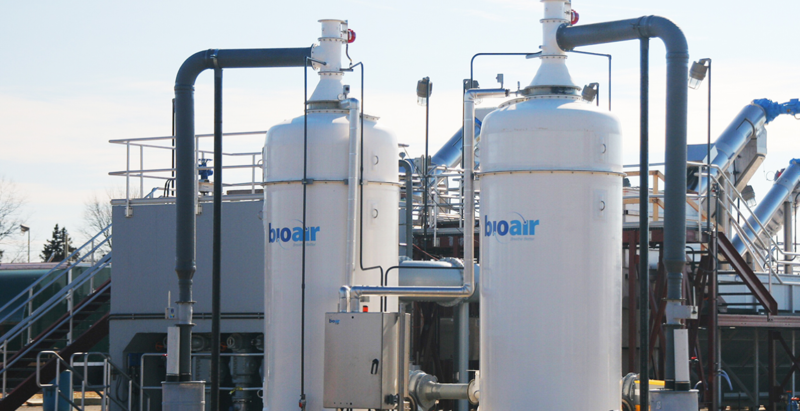 Through scientific research and process expertise, BioAir Solutions provides odor and emission control for municipal and industrial wastewater treatment sites around the world. Whether your current odor control is failing, you’re planning a facility expansion or thinking about building new, our team is ready to take on your odor and emission challenges. You can learn more about our approach to solving them by reading our guide to industrial odor control. 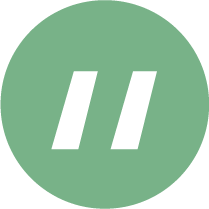 If you’re ready to discuss a solution, or want to schedule an on-site survey, contact us now.